Anyone who's read a few of my past posts knows I'm training for the Pfalz Point Trail Challenge in September. As someone who's run a lot in the past, finishing the race shouldn't be too hard. Doing well in it, well that's another story. I've done quite a few shorter trail races this year, and I have a pretty good grasp on 5k pacing. 15k (or 10-mile) pacing will be quite a bit different. It's still a fast race, but not an all-out sprint like a 5k. I've continued to run throughout the summer in anticipation of the race. 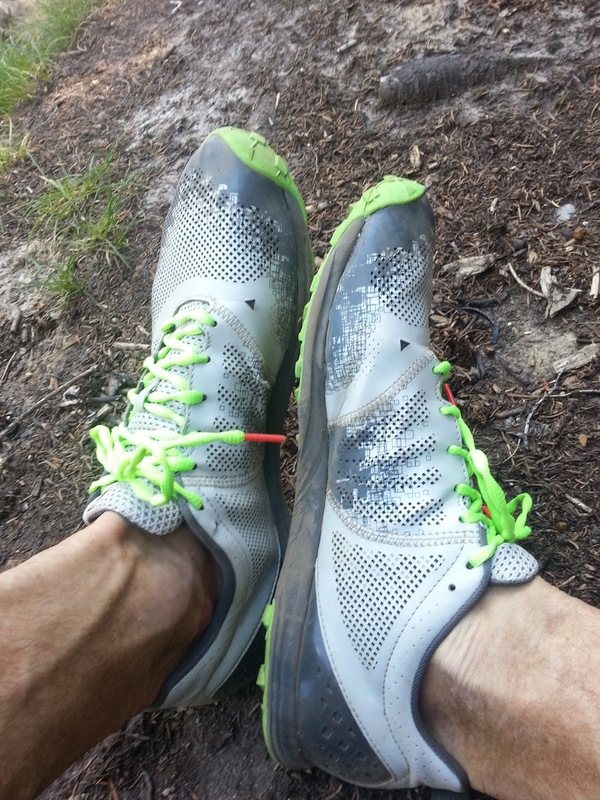 After dealing with a soft tissue injury in the top of my right foot (from forefoot striking in minimalist shoes I think) I began trail running more. It's helped keep running from feeling abysmally boring. Despite the challenging terrain, lots of rocks, roots, and heinously steep climbs in the Holyoke Range near my home, my body seems less tired and I can do longer outings. After a day of work in the Catskills this summer I ran Kaaterskill High Peak. A wrong turn left me lost in the woods and changed the run into a leg cramping nightmare. I ran the final long downhill when I could, and walked when I felt the hamstring cramps creeping in. The run left me feeling really good though, and I began to see the potential. Now, as I drive around, especially in mountainous or hilly regions, each rise on the horizon presents itself as a new uphill struggle, a completeness of focus on the way down. Each flat is a place to gain speed and charge through the woods. Running has taken on new meaning with new goals and challenges for the future. 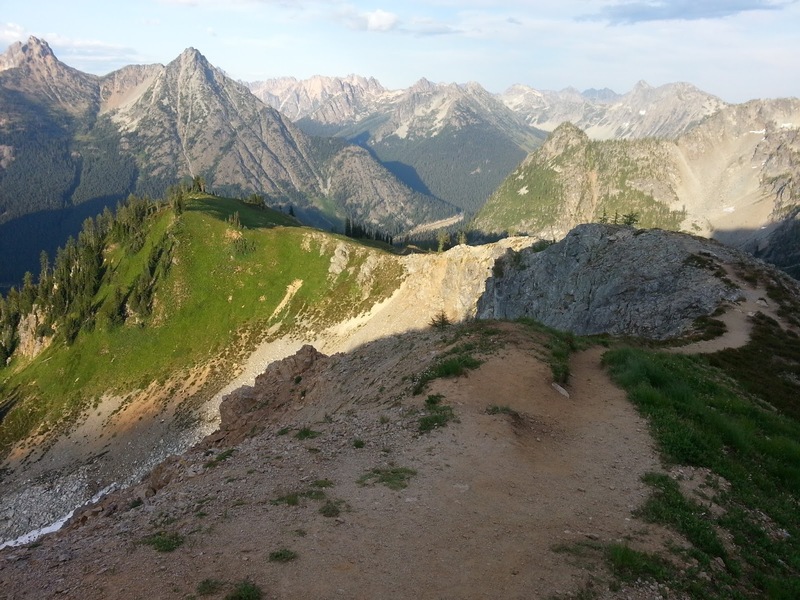 I was recently in the Cascades guiding for a few weeks and on my days off I was been able to run in North Cascades National Park. 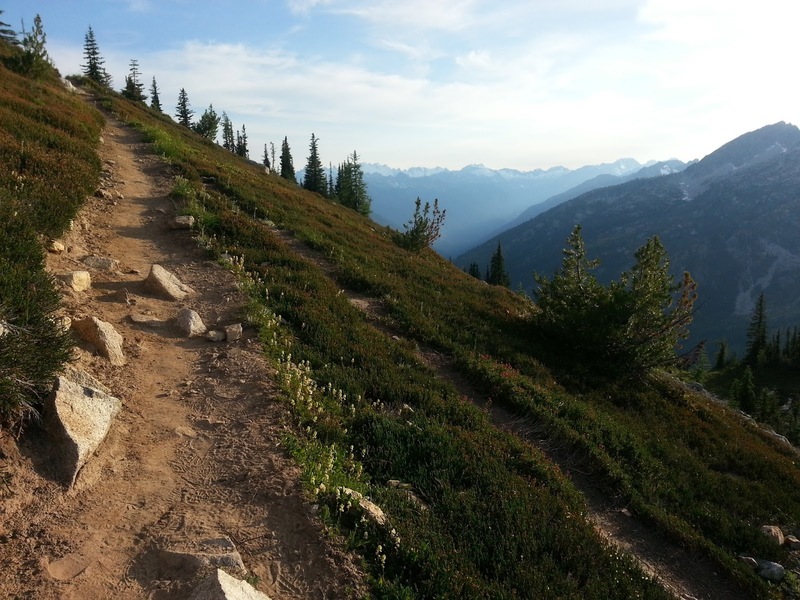 Many of the more popular trails out west are less rocky and far less technical than our eastern counterparts. You can maintain greater speed on the uphill and really charge down when the grade lessens. Starting up the South Arete, South Early Winters Spire. For my first day off I ran the amazing Maple Pass Loop, a 7-mile above treeline jaunt around, and high above, a small lake (Ann Lake?). The loop took 1:21 with a few breaks for some pictures. on the trails. A review is on it's way! On my second day off, and with sluggish legs, I ran from the Blue Lake trailhead up to South Early Winter Spire. From there I climbed the South Arete, downclimbed, slipped and wobbled down the talus, and then charged back to the car. Despite being only 4.5 miles, this loop gains 2500' and involves climbing a 600' 5.4 ridge (mostly 4th class). This out and back effort ended up taking 2:04. Despite doing two long days in a row, I felt good. My endurance seems like it's improved. After Pfalz Point I'm looking forward to a few more longer mountain efforts. Things like the Presidential Traverse, the Franconia Ridge, and the Escarpment trail come to mind. Adding some climbing into the mix could make things really interesting too. 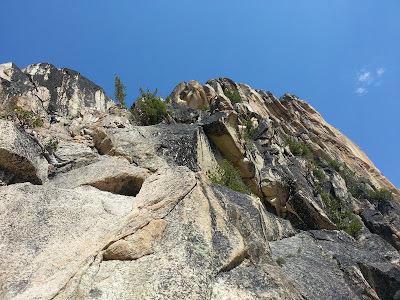 The bottom line is that when one stops looking at "running" as just running, and "climbing" as just climbing there's so much potential for adventure out there.